Big Walnut’s Katie Cochran is defended by Olentangy Orange’s Aurelia Johnson during the first half of Tuesday’s non-league showdown in Lewis Center. 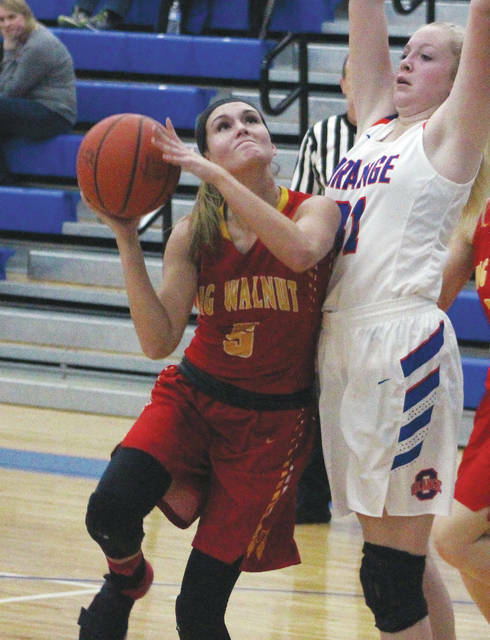 The Big Walnut girls basketball team used a 10-1 run in the first quarter to take the lead and a 7-0 run in the second quarter to take control on its way to a 52-40 victory at Olentangy Orange in non-league action Tuesday night in Lewis Center. Senior Katie Cochran had 15 points and 14 rebounds and Avery Schone came off the bench and scored 14 points and dished out eight assists to lead the Golden Eagles (5-3), who snapped a three-game losing streak. Cochran, a post player for BW in the past, has taken to playing the wing this season like a fish to water. She’s tall and slender, standing at 5-foot-11. She can post up smaller players and use her speed to beat bigger opponents. Six players had first-quarter baskets for BW in a balanced first-half attack. Schone’s basket started a 10-1 run and Abby Facemyer, Rylee Bussen, Cochran and Erin Boehm followed as the Eagles built a 12-5 lead at the end of one. McKenna Ford buried a pair of three pointers around a pair of Cochran baskets and then found Aurelia Johnson for a layup underneath as the Pioneers got it as close as 16-13 with 3:27 left in the first half. But, BW followed up with a 7-0 run to push the lead back to 10 and led 23-14 at the break. BW pushed the lead as high as 17 in the fourth quarter before a Madi Felchin three-pointer helped the Pioneers close the gap. Ford led the Pioneers (1-6) with 17 points on the strength of four threes and Riley Duffy hit two more and finished with eight points in the loss – Orange’s fifth straight. Johnson left the game in the second quarter with an apparent left knee injury. It’s another tough loss for the Pioneers on the injury front. Senior Alyssa Feeley has been battling a back injury as well and did not play in Tuesday’s game. Both teams are back in league action next. BW hosts Newark in OCC-Capital play Thursday night at 7:30 p.m. and Orange visits Westerville South in OCC-Buckeye play Friday night at 7:30 p.m.